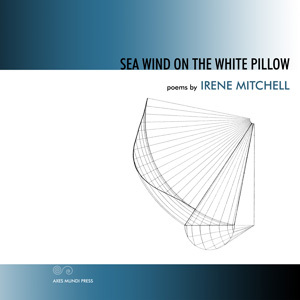 In revealing the inspiration for her new collection, Sea Wind on the White Pillow, poet Irene Mitchell credits a seaside environment. " I have followed the sea's promise all my life. To a lyric poet such as myself, the ocean is a source of mindful invigoration and health. That is where my thoughts are picked up by the wind, tossed around, ultimately deciphered, all as witnessed by that great objective observer, whether the Atlantic or Pacific, the Gulf, the Caribbean or Mediterranean - all the oceans in which I swam, often contentedly, sometimes with uneasy trepidation." In a review of Sea Wind on the White Pillow, writer and critic Karen Schoemer notes that "In Irene Mitchell's work, the common world and its uncommon dimensions both come beautifully into focus.... From...minor moments, magnificent meanings unspool."